Vintage Leafs is a blog that posts pictures from the Toronto Maple Leafs' past. 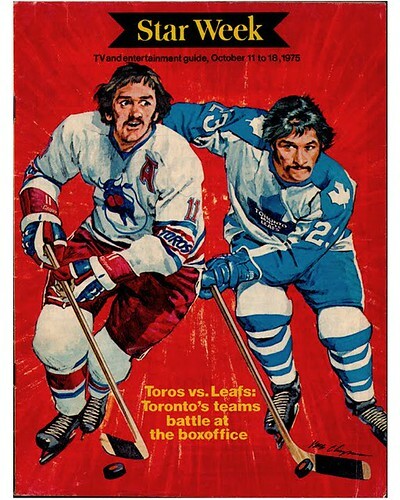 Today Vintage Leafs posted this cover from the Toronto Star's Star Week in 1975. If you're my age or younger, you don't remember the Toronto Toros. 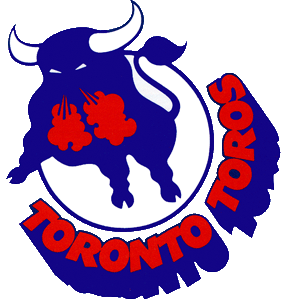 The Toronto Toros were a WHA team that played in Toronto from 1973 to 1976. The fun stuff happened when the Toros left Varsity Arena for Maple Leaf Gardens for the '74-'75 season, hence this cheeky Star Week cover. The Toros moved to the Gardens for the 1974–75 season. However, by this time Harold Ballard had regained control of the Gardens. Ballard was a violent opponent of the WHA; he never forgave the upstart league for nearly decimating the Leafs' roster in the early 1970s. He deliberately made the Toros' lease terms at the Gardens as onerous as possible. The Toros' lease with Maple Leaf Gardens Ltd. called for them to pay $15,000 per game. However, much to Bassett's outrage, the arena was dim for the first game. It was then that Ballard demanded $3,500 for use of the lights. Ballard also denied the Toros access to the Leafs' locker room, forcing them to build their own at a cost of $55,000. He also removed the cushions from the home bench for Toros' games (he told an arena worker, "Let 'em buy their own cushions!"). It was obvious that Ballard was angered at the WHA being literally in his backyard, and took his frustration on the renegade league out on the Toros. I had, and I believe still have a Toronto Toros keychain with this logo. Classic! I could never figure it out, why the Toros? BS? Sunday Night Hockey on Global with Mike Anscombe doing play-by-play. Cheap tickets, lots of guys with personality and loud jerseys. The rink in St. Paul where the Fighting Saints played had the clear boards. Would be great to see someone else take on the Three Point Hockey League. They probably went with Toros for sake of alliteration, knowing that would also work with the same logo when they'd later become the Birmingham Bulls. It doesn't make any less sense than having an NBA team named for a type of dinosaur. The GTHL York Toros took on this logo. I coached there for a while and still wear my coaching jacket when it's really cold, even though it has a logo from a team I no longer represent. Men at the office stop me so often, because they think it's the Toronto Toros logo. Tommy "Shotgun" Simpson on right wing, Gilles Gratton in net, and yes the great Anscombe on play by play. Ballard really turned the screws on Johnny Bassett. Don't forget Leapin' Lou Nistico, the Big M, Vaclav Nedomansky, Mark Napier...My dad bought season's tickets for his company and I went to a lot of games - 3rd row greens at centre ice, just behind the centre ice camera position. Amazing seats!That's actually probably what made me go to Ryerson for Radio and Television - I wanted that job!